Apple、Intelligent Tracking Prevention 2.0やパスワードの使い回し警告をサポートした「Safari Technology Preview v59」をリリース。 | AAPL Ch. Safari Technology Preview Release 59 is now available for download for macOS High Sierra and the beta of macOS Mojave. If you already have Safari Technology Preview installed, you can update from the Mac App Store’s Updates tab on macOS High Sierra and in the Software Update pane of System Preferences on macOS Mojave. This release covers WebKit revisions 232108-232790. 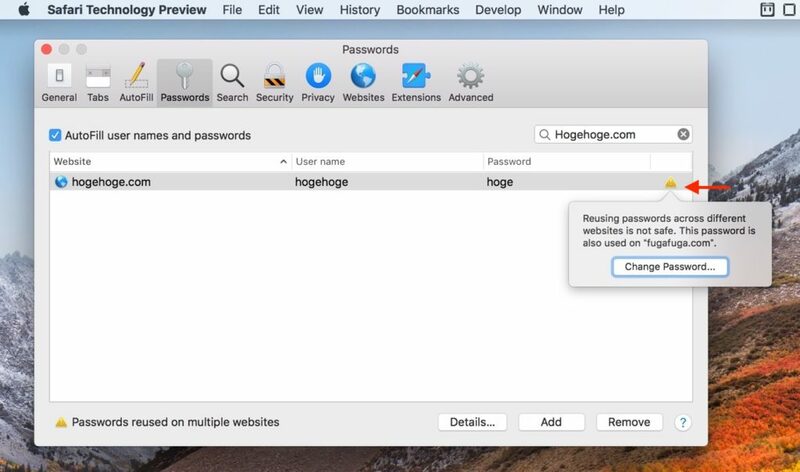 Automatic Strong Passwords, a feature of the iCloud Keychain password manager in iOS 12, will make it easy to use random, unique passwords across websites. To help clean past mistakes, STP 59 introduces support for a Well-Known URI for changing a password.